Superbugs, also known as Gram-negative bacteria, are causing a global health crisis. Each year in the United States, at least two million people contract an antibiotic-resistant infection, according to the Centers for Disease Control (CDC). Of those, 23,000 people die. One way to stymie this crisis is to avoid contraction. But no one goes looking for bacterial infections. So, while health care professionals and food industries work to constrict the spread of E. coli, staph, and the deadly C. difficile infections, researchers are looking for new ways to skirt the impressive Gram-negative defense system. Daniel Kahne, the Higgins Professor of Chemistry and Chemical Biology, and his lab are dedicated to determining how Gram-negative bacteria work. In the last decade, he and his team discovered an integral machine that builds each bacterium's powerful protection, an outer membrane constructed with a beefy molecule called lipopolysaccharide (LPS). "Because there are no antibiotics for some Gram-negative infections, learning how the outer membrane is assembled and how to interfere with assembly has major medical implications," Kahne says. Construction isn't simple. The bulky LPS is made inside the bacteria's cytoplasm, which is separated from the outer membrane by two additional barriers. Within the cytoplasm, the molecule ATP provides enough energy to produce the LPS building blocks and move them around the cell, like microscopic construction workers. But these workers (ATP) cannot cross the membrane barriers to transport LPS to the outer membrane work site. Graduate student Tristan Owens decided to solve this mystery. In 2013, after spending a year teaching in Qatar, Owens returned to the United States to join the Kahne lab. That Fall, he told Kahne he planned to figure out how LPS gets to the outer membrane, a problem that scientists have been working on since the early 1970s. "As advisors often do, I assured him this would be possible," says Kahne. To tackle the mystery, Owens would have to answer two major questions. First, if those tiny construction workers cannot follow LPS through the bacterial membranes, what pushes the molecule where it needs to go? He and the Kahne lab already discovered that a protein bridge guides the LPS across. But, without any energy to push the building blocks through, they should just fall back into the cytoplasm like so many apples thrown into the air. For the second question, Owens would have to determine how LPS gets onto the protein bridge in the first place: How does the bacterial machinery distinguish LPS from the other molecules floating around in the cytoplasm? "It was estimated in the 1970s that it would be necessary to move about three million LPS molecules every five minutes per cell to make the outer membrane," Kahne says. The bacterial machines had to be efficient. Now, six years and a dissertation later, Owens can explain how they run their well-organized operation. In a paper published in Nature, first author Owens identifies two crystal structures responsible for extracting LPS from the cytoplasm and moving the molecule onto the protein bridge. Previous research proposed that LPS gets to the bridge via multiple pathways, but Owens' work determined that ATP shuttles the molecule along just one path. Owens also discovered how the LPS continues to move through the bridge without help from the ATP construction workers. Like a Pez machine, the protein bridge opens and closes gates that keep the LPS moving up toward the outer membrane. "The gate provides an explanation for unidirectional transport," Kahne says, "because gate closure prevents backflow." The more scientists know about how Gram-negative bacteria build their outer membrane, the closer they get to dismantling their powerful defenses. 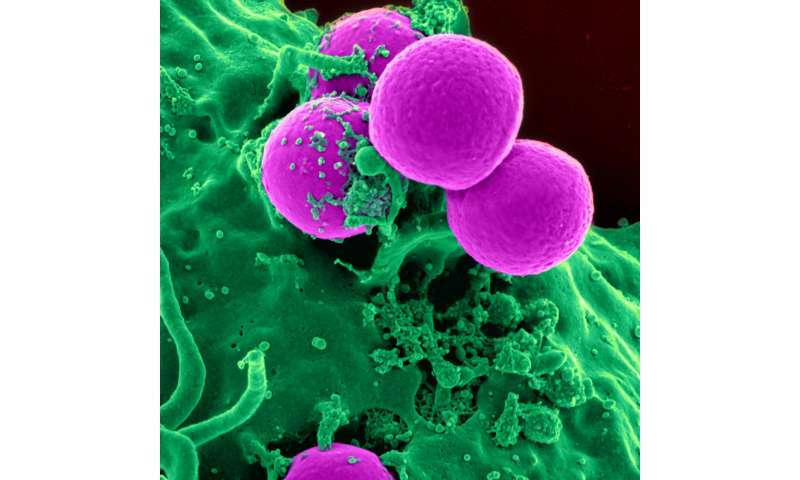 Now, with this decades-old mystery solved, researchers can start to develop new drugs that slow the bacteria's efficiency, hobble their machinery, and make them vulnerable to our antibiotics once again.